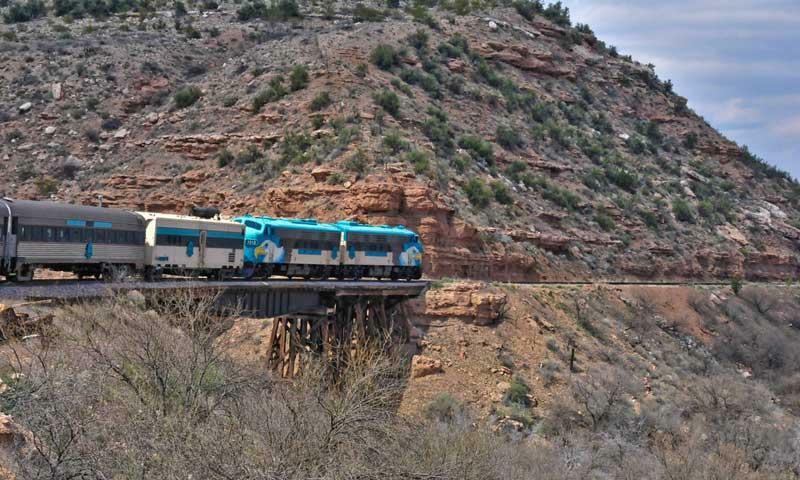 Travel on one of the oldest forms of transportation in Arizona, the Verde Canyon Railroad. Hop on board and prepare yourself for a four-hour adventure through the high desert. With so many open roads it's easy to think you've seen all the Prescott area has to offer - not true, until you've ridden the Verde Canyon Railroad. What can I see along the Verde Valley Railroad? This trip is the ideal way to end an otherwise adventure packed, go-go-go vacation. Once onboard, head outside to listen to the gentle chugging of the train as you wind your way through some of Arizona’s most beautiful country. The depot is located at 300 North Broadway, in Clarkdale, Arizona, about an hour and 15 minutes from Prescott. To get there, head out the backside of Prescott, down 89A. Drive about 25 miles or so, over the mountain, enter the roundabout and take the 2nd exit onto Clarkdale Parkway. This road becomes 11th Street, you’ll want to turn right onto Main Street/AZ-260. Then turn left onto Broadway and you will see it on the left. The train is open at various times year-round (the itinerary changes slightly based on season). Visit www.verdecanyonrr.com for a complete schedule of events, from the Grape Train Escapes in summer to The Christmas Express in winter. The cost varies depending on which trip you will be taking. For the general tour, tickets run from $34.95 for children to $79.95 for adult first-class. Visitors with additional questions can call 1-800-582-7245 for additional information.